Having problems with an HVAC unit at one of your facilities? There’s a good chance one of these problems is the cause. Ensuring your customers and your employees are comfortable in your facility is crucial to the efficient operation of your business. Because of this, there is a large dose of responsibility placed on the efficacy of your HVAC systems. Depending on the hours of operation and the climate of the geographical location, your HVAC systems and the equipment within them can take quite the beating. Sure, they are engineered to be workhorses, meant to take a beating. However, it is inevitable that Father Time will take his toll, chipping away at the competence of those systems day by day. For this reason, systematic maintenance checks on a regular cadence become very important to ensuring your systems continue to run at their maximum efficiency. During those checks, a good HVAC technician will be able to spot any inefficiencies and give recommendations on how to cost-effectively repair the issue so it doesn’t become a larger problem down the line. While speaking with the technician about those issues, you want to make sure you have at least a basic understanding of what he is referring to, so you can make an educated, confident decision on how to move forward. If you aren’t too HVAC savvy, don’t worry, we’re here to help. We’ve put together a list of the most commonly occurring HVAC problems (along with visual aids) which, if caught and fixed early, can help prevent a costly business halting system failure. Leaks and scrambled compressors are the most common issues found within this category. The presence of oil around service ports, valves or solder connections or compression fittings can indicate a refrigerant leak. The queue a scrambled compressor gives off is not visual, rather audible. A scrambled compressor can run much louder than a normal compressor. You can hear the hum of a locked rotor or the repeated starting and stopping (short cycling) of a compressor indicating a problem with the refrigerant charge. 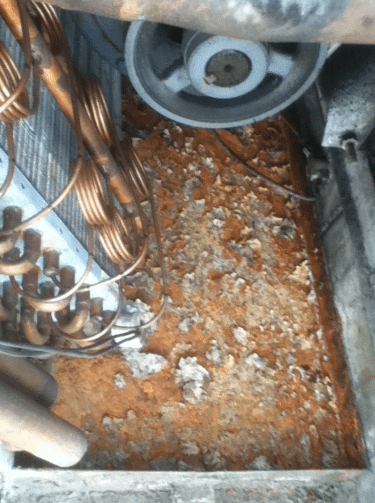 Clogged or dirty condenser coils can be detected visually and can lead to restricted air flow. In addition to dirt, coil fins can deteriorate from salt or chemicals causing restriction and poor heat transfer. 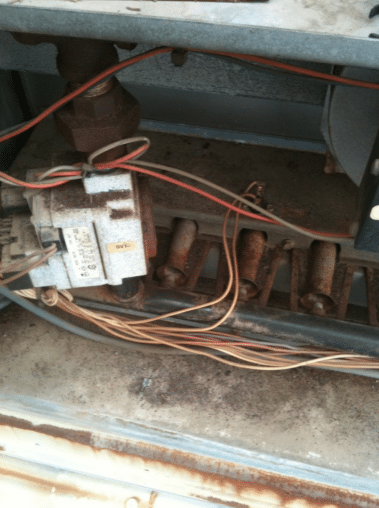 Condenser fan issues affect proper air flow and can eventually lead to failure. Common indicators there is an issue with the fan are bearing noise, short cycling (repeated starting and stopping from thermal overload), excessive fan blade vibration, deteriorated wiring or connections, and incorrect fan speed/direction. 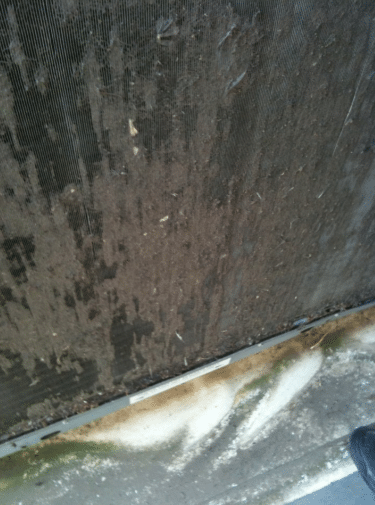 Condenser leaks are also common and can be identified by leaking oil. You can tell the economizer isn’t functioning properly when it is not engaging when the outside air (OA) temperature is below 55 degrees. The OA dampers should be open and the return dampers closed when the OA temperature is below 55 degrees. A reason economizers can fail is that of excessive dirt. Built up dirt on dampers, gears, linkage, or controls can cause malfunction. 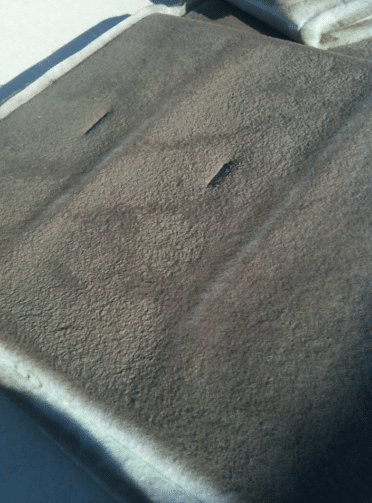 Damaged or missing outside air filters can also cause the economizer to malfunction. Preventative maintenance programs, when followed properly, should keep filter issues and dirt build-up from occurring. The primary purpose of the air filter is to protect the evaporator coil. When air filters within your system are dirty or don’t fit tightly, air is allowed to bypass the filter which causes the evaporator to get dirty. When dirt starts to load up or cake on the face of the coils, airflow is restricted. The accumulation of dirt can impact heat transfer and operational efficiency, causing further problems and eventual failure. The condensate drain pan should slope toward the drain. When the drain is clogged or the pan level water stays in the pan and slime and dirt will accumulate. This can cause complete drain failure, water damage, and poor air quality. 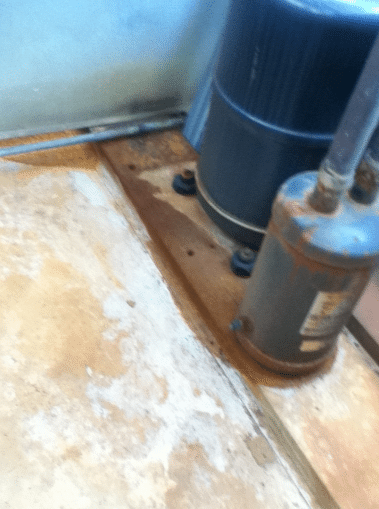 Also, over time metal drain pans can rust and leak. 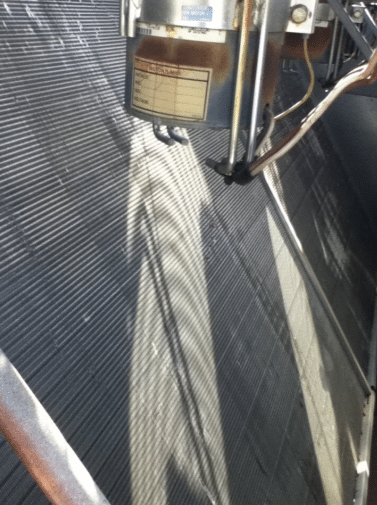 Like the condenser fan, anything that affects proper airflow can lead to failure. Problems with the evaporator fan can equate to the same fate. 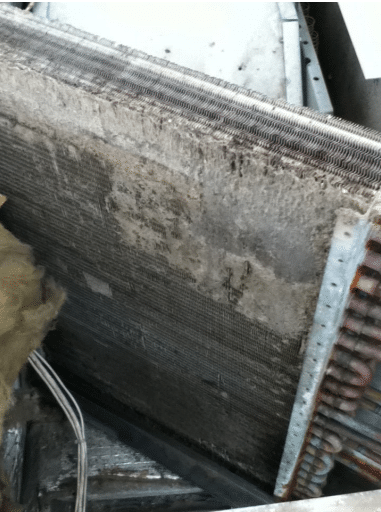 Problems with the evaporator fan can include but aren’t limited to, insulation or debris stuck in the fan, excessive vibration from an unbalanced fan, bearing noise, motor failure from a locked motor, or other electrical failures. 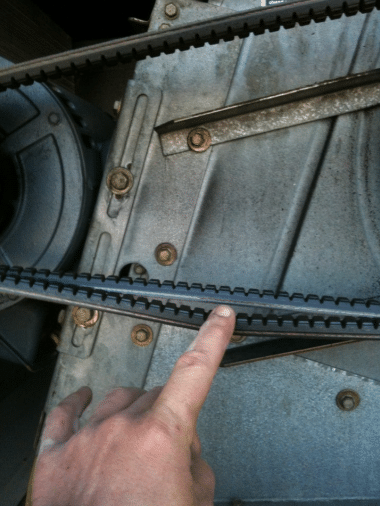 Loose evaporator belts are a common problem and can lead to low fan rotation speed. They can be easily seen, heard, and documented. The two typical problem areas within heating and controls are issues found with the burners and electrical connectivity. Electrical problems can occur due to connections overheating. When this occurs you will typically see some sort of discoloration. Other concerns could be failing contractors, which will cause an audible sound or sloppy wiring. The efficiency of the burner can be compromised due to soot and rust particles building up from the heat exchangers. This could also cause other issues such as flame roll-out (poor combustion) and pilot failure. Problems with the housing of the unit are typically easily visible. 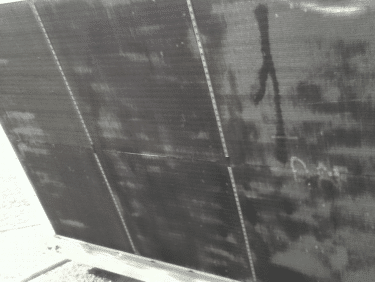 Problems could include bent or poorly fitting panels or missing panel insulation (especially common with older units). Rusty or deteriorated housing is also a common issue especially for older units in coastal areas. Catching these problems early and fixing them before they become a major, failure-inducing issue is crucial to your budget and the comfort of your customers and employees. Vehemently sticking to the cadence of your maintenance schedule is paramount to achieving that goal. One thing to remember – when building your HVAC preventative maintenance program whether it be alone, or with your maintenance vendor, customize it as much as possible to your specific needs. Take into account the type of equipment you operate at each location, the age, and condition of the equipment, along with the geographical location of each site. This will give you a good idea of how often you need to schedule your checks throughout the year. If you oversee a large number of facilities, try to group similar locations together based on equipment and location. Then, create a program for each group instead of doing them individually as that could be a painstaking process. The time you spend up front building a proper HVAC maintenance program, and then sticking to it, will inevitably save you time, money, and frustration over the long haul.